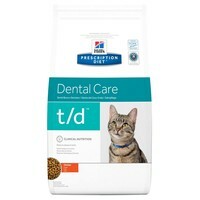 Hills Prescription Diet TD Dental Care Dry Food for Adult Cats is a nutritionally complete diet for the management of dental disease and to help maintain oral health. exelent price for this food which is loved by all of my cats. Service & delivery is second to none. Your service has been excellent from the first to the latest order. This is the ONLY food my cat now eats! The vet suggested it for a dental problem and now can't believe how good our cat's teeth are. It must work! If a vet doesn't suggest treatment - and is happy - it must be good. Both my cats developed dental problems when they were 3 years old and had to have veterinary treatment. I was recommended this product by my vet but it was very expensive from them. I often use this website so had a look here and was very pleased to find it at a much cheaper price. The cats really like it (they can be fussy with dry food) and their teeth have been in good condition when the vet has checked since. Thanks VetUK! My two rescue cats, now 12, have been fed t/d all their lives and have never had any dental problems. One, still very nervous, can only be bribed by handfuls of t/d, so it must taste pretty good! been using this product for over 15 years now and one of my cats who died aged 16 last year, had never had any dental problems. his teeth were still lovely and clean with none missing! I give my cats only a small handful each once daily as its quite fatty but they all really enjoy these bickies. My cat had tooth and gum problems at a young age ending up with several teeth being removed. The vet recommended this product to help keep her remaining teeth healthy. I use it as a top up food giving my cats a small handful every morning on top of their ususal food. This seems to be enough to keep their teeth healthy, I have been using it for around 3 years now. Both cats love the taste and eat it in preference to their other food. t/d prescription diet was recommended by my vet for my 16 year old cat to save her remaining teeth from further decay after a tooth operation to remove some. I bought from VetUK as so much cheaper than bought from the vets. My cat now has a clean dental record. The bonus is that she loves the food! My British Shorthair cat has always been vulnerable to teeth/gum disease and my Vet recommended Hills Prescription T/D as the best means to address this problem. Since then my cat has had daily access to a bowl of Hills T/D diet (which she really enjoys) and today after an annual visit to my vet for her annual check-up my cat has come through with flying colours - she is free of any dental problems. I can thoroughly recommend Hills T/D Diet as an excellent diet for any cat.